Pinellas County Real Estate Statistics for February 2019 | Feather Sound News & Beyond! 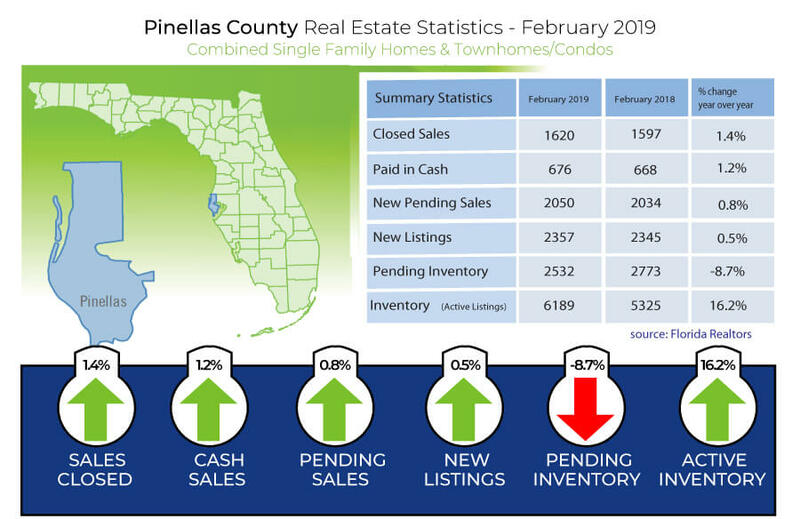 Pinellas County Real Estate Statistics for February 2019 – Feather Sound News & Beyond! Pinellas County continues to see a rise in year over year sale prices and months supply of inventory. The Average Sale Price for Single Family Homes rose 14.1% from $318,139 in February 2018 to $362,988 in February 2019. The Average Sale Price for Townhome/Condo was $329,617 in February 2019, up 40.7% from $234,296 in February 2018. The Months Supply of Inventory for Single Family Homes increased 19.2% year-over-year, with a 3.1 Month Supply this February, as compared to a 2.6 Month Supply in February 2018. The Months Supply of Inventory for Townhome/Condo rose 19.4% at 3.7 months in February 2019 from 3.1 months in February 2018. The Median Sale Price for Single Family Homes was up by 8.5% from last year, at $265,000 for February 2019 versus $244,250 for February 2018. Dollar Volume for Single Family Homes saw a 12.1% increase from $295.9 million in February 2018 to $331.8 million in 2019. The Median Time to Contract for Single Family Homes was up 53.1% from 32 days in February 2018 to 49 days this February. The Median Time to Sale for Single Family Homes was 87days this February, up 19.2% from 73 days last February. New Listings for Single Family for February 2019 were 1,347, up 0.6% from February 2018 at 1,339. The Active Listings for Single Family Homes rose 15.2% from 2,976 in February 2018 to 3,429 in February 2019. Closed Sales for Single Family were down 1.7%, with 914 in February 2019 versus 930 in February 2018. Paid in Cash sales for Single Family increased 7.0%, from 273 in February 2018 to 292 in February 2019. The Median Sale Price for Townhomes/Condos was $187,000 for February 2019, up 21.4% from $154,000 in February 2018. Dollar Volume for Townhome/Condo increased 48.9% year-over-year, with $156.3 million in February 2018 compared to $232.7 million in February 2019. The Median Time to Contract for Townhome/Condo market was 36 days in February 2019, up 28.6% from 28 days February 2018. The Median Time to Sale for Townhome/Condo market was 74 days in February 2019 and 65 days in February 2018, up 13.8%. New Listings for Townhome/Condos for February 2019 were at 1,010, up 0.4% from 1,006 in February 2018. Active Listings for Townhomes/Condos were up 17.5% from 2,349 in February 2018 to 2,760 in February 2019. Closed Sales for the Townhome/Condo segment increased 5.8% year over year, at 667 in February 2018 versus 706 in February 2019. Paid in Cash sales for Townhome/Condo decreased 2.8% from 395 in February 2018 to 384 in February 2019. Information provided by Pinellas Realtor Organization.